A bridge rectifier circuit is a common part of the electronic power supplies. Many electronic circuits require rectified DC power supply for powering the various electronic basic components from available AC mains supply. We can find this rectifier in a wide variety of electronic AC power devices like home appliances, motor controllers, modulation process, welding applications, etc. What is a Bridge Rectifier? A Bridge rectifier is an Alternating Current (AC) to Direct Current (DC) converter that rectifies mains AC input to DC output. Bridge Rectifiers are widely used in power supplies that provide necessary DC voltage for the electronic components or devices. They can be constructed with four or more diodes or any other controlled solid state switches. Depending on the load current requirements, a proper bridge rectifier is selected. Components’ ratings and specifications, breakdown voltage, temperature ranges, transient current rating, forward current rating, mounting requirements and other considerations are taken into account while selecting a rectifier power supply for an appropriate electronic circuit’s application. 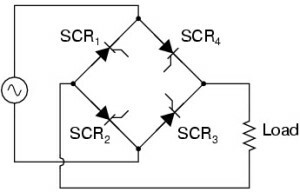 Bride rectifiers are classified into several types based on these factors: type of supply, controlling capability, bride circuit’s configurations, etc. Bridge rectifiers are mainly classified into single and three phase rectifiers. Both these types are further classified into uncontrolled, half controlled and full controlled rectifiers. Some of these types of rectifiers are described below. The nature of supply, i.e., a single phase or three-phase supply decides these rectifiers. 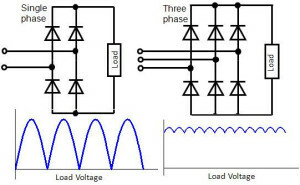 The Single phase bridge rectifier consists of four diodes for converting AC into DC, whereas a three phase rectifier uses six diodes, as shown in the figure. These can be again uncontrolled or controlled rectifiers depending on the circuit components such as diodes, thyristors, and so on. 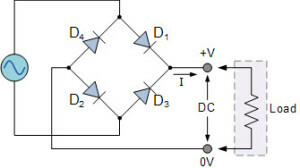 This bridge rectifier uses diodes for rectifying the input as shown in the figure. Since the diode is a unidirectional device that allows the current flow in one direction only. With this configuration of diodes in the rectifier, it doesn’t allow the power to vary depending on the load requirement. So this type of rectifier is used in constant or fixed power supplies. In this type of rectifier, AC/DC converter or rectifier – instead of uncontrolled diodes, controlled solid state devices like SCR’s, MOSFET’s, IGBT’s, etc. are used to vary the output power at different voltages. By triggering these devices at various instants, the output power at the load is appropriately changed.